When people decide to start with exercising, it is very important to choose an activity that will not cause boredom after a while. It might not seem so important at the beginning, because exercises should not be regarded as interesting or boring, but that just might be essential. Exercising should last for a long time, some say that physical activity should be applied throughout the entire life. Therefore, choosing an activity that will always remain interesting is very important. That is why, when it comes to increased physical activity, a lot of people tend to turn to martial arts. Martial arts include both, physical activity and learning how to physically subdue an opponent. Most of the martial arts use a combined type of training. Those two types are cardio workout and muscle mass increase. Cardio workout includes running and aerobic forms. Running is used in almost all martial arts trainings and is excellent warming up exercise. It activates almost all muscle groups and warms those up to a working level which will prevent certain problems like muscle spasms, all sorts of strain (muscle, ligament and tendons) and joint issues. Muscle mass increase is also needed, at least to a certain level. Strength is needed for more effective performing of certain techniques, and is especially emphasized in martial arts that are based on kicking and punching (kickboxing, for example). Even though kickboxing benefits from increased muscle mass, it is not essential. What are kickboxing exercises facts? Strength is needed, because every punch and kick needs to be as strong as possible. But the effectiveness of punches and kicks does not depend on muscle mass only. A balance between muscle mass and speed should be at the most effective level possible. Sometimes, a hand that does not have extremely developed muscles can land a powerful punch if a speed is high. 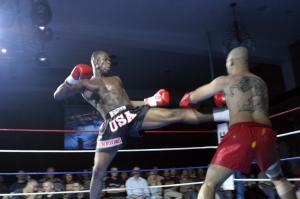 In some cases, increased muscle mass only slows down a kick boxer. When it comes to fat burning, statistics say that one hour of kickboxing spends about four hundred calories per hour. It is important to exercise properly, especially when it comes to martial arts. When performing a regular physical activity, the only person that can be hurt is the performer, but in the martial arts, inadequate practice can hurt someone else too. That is why in martial arts, it is essential to listen to instructor and apply the techniques as told.